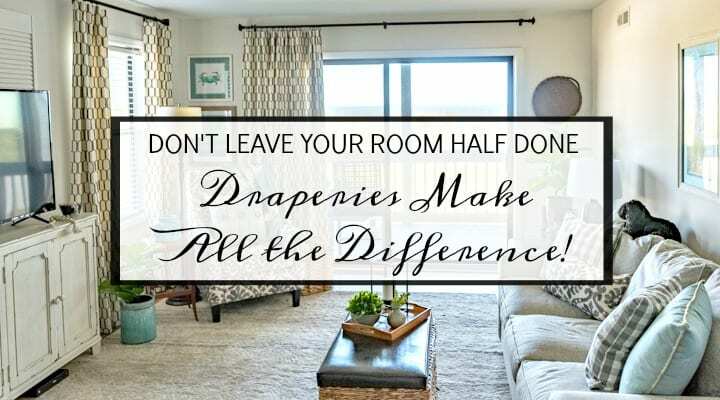 Draperies are the jewelry in a room and are just as important as any other element of the decor in your room. Windows without some sort of treatment tend to look unfinished and blah. They are a great way to tie a room together and make it more inviting. I was compensated for this post by The Interior Alternative, but all opinions are 100% my own. See my disclosure HERE. 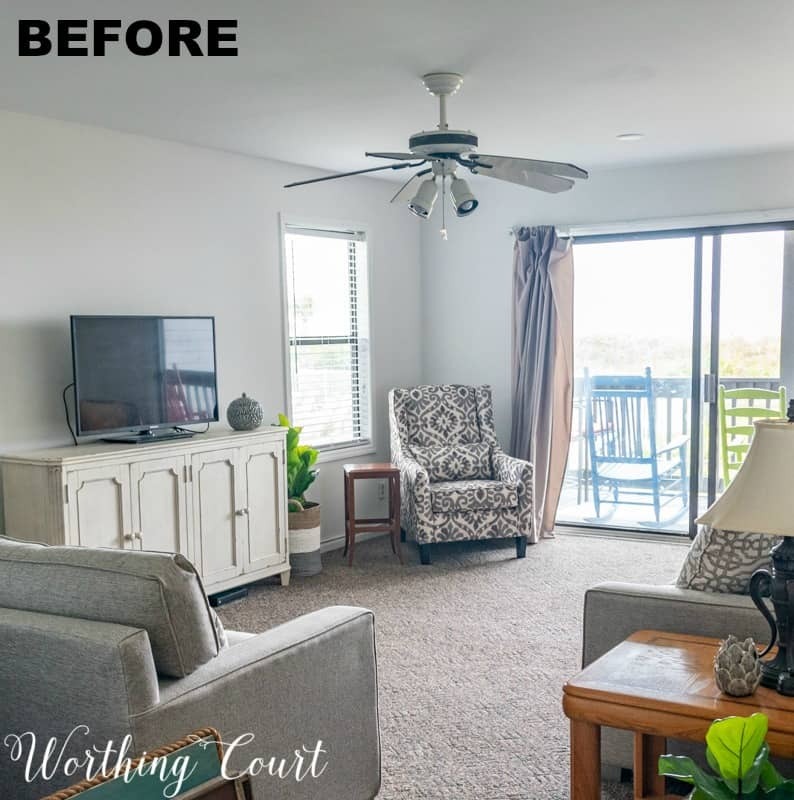 We’ve been working on the makeover of the living room in our beach condo for months and I’m finally starting to put the finishing touches on the room! This is how the living room was looking shortly after we moved all of our furniture in. The original draperies and wall-to-wall carpeting were still in place and the whole thing was looking very uninspiring. We’ve lived with these non-functioning, falling-off-the-rod, aggravating draperies ever since last August and I’ve been itching to replace them! Thus, began my search for the perfect fabric and oh, what an epic search it was! I wanted something neutral with just a little bit of a pattern to add interest, but not fight with the other patterns that we already had in the room. As a total aside – yes, there is a lot of pattern in this room! 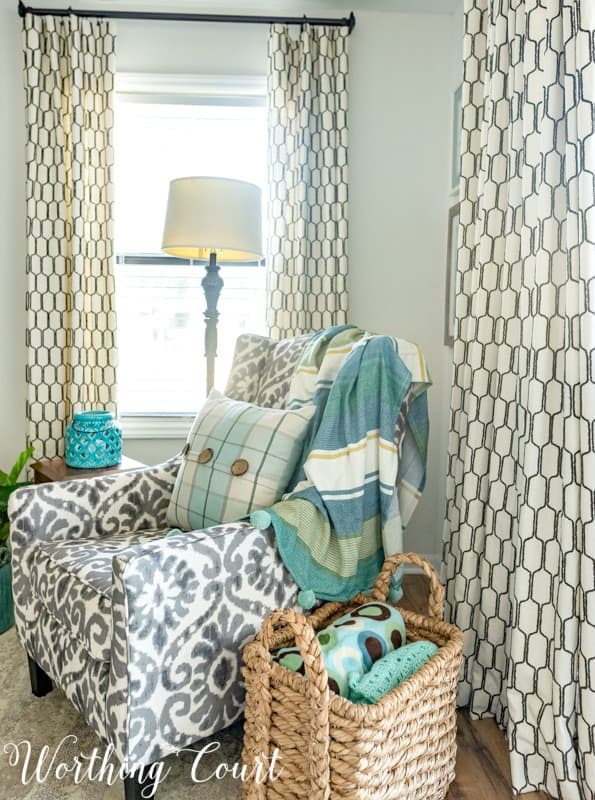 But I adore mixing patterns and I believe that if done carefully, you can mix several patterns in the same space and wind up with a terrific looking room. I ordered oodles of fabric samples online and shopped every local store I could think, all to no avail. So frustrating. But then, THEN(! ), I remembered that we recently had a brand new mega fabric store called The Interior Alternative open here in Greensboro, NC. I found the PERFECT fabric there! Don’t worry – you can take advantage of this awesome resource even if you don’t live near one of their six locations – read more below. Back to the draperies – after spending a few days in my sewing room, this is what the windows in the living room are looking like today! My two “helpers” just had to be in the pictures even though Buddy looks like he’s playing peek-a-boo behind the chair leg on the deck. I needed actual functioning draperies, that I could completely close, but would still look pretty when they’re open. To save on the amount of fabric that I needed, I made simple flat panels that hang from clip-on rings instead of pleated draperies that hang from drapery hooks. Be sure to come back next week where I’ll share step-by-step directions for how to make a flat drapery panel just like the professional workrooms do. Let me tell you more about The Interior Alternative, because this is a place that you NEED to know about, even if you don’t live near one of their locations! There are 6 locations across the nation – Greensboro, Burlington and Charlotte in NC, Newark, DE, Vernon Hills, IL and Fountain Valley, CA. Don’t fret if you don’t live near one of their locations – they are happy to help you search for a fabric you may be looking for. Simply call or email the stores. Include a photo of the fabric that you’re looking for in the email so they can search and try to locate the specific fabric. They can ship the fabric from any of their locations at the customer’s expense. Each store offers approximately 400,000 yards of drapery weight and upholstery weight fabrics in roughly 5,000 different patterns. They offer the most extensive assortment of fabrics at the lowest prices in the industry. They carry drapery linings and a variety of poly and down pillow forms in multiple sizes, batting, cording and burlap. They offer pre-made decorative pillows. Custom labor for upholstery, draperies and bedding is available in the Vernon Hills, IL and Newark, DE locations. Learn more about each individual location by clicking HERE to visit their website. Affiliate links have been used, which means that I make a small commission from your purchase, but at no additional cost to you. See my disclosure HERE. What a difference the curtains make! Warms up the space without overtaking it! Thanks for sharing! Love the draperies Suzy. I would not be brave enough to add the patterned chair, but you make it work. 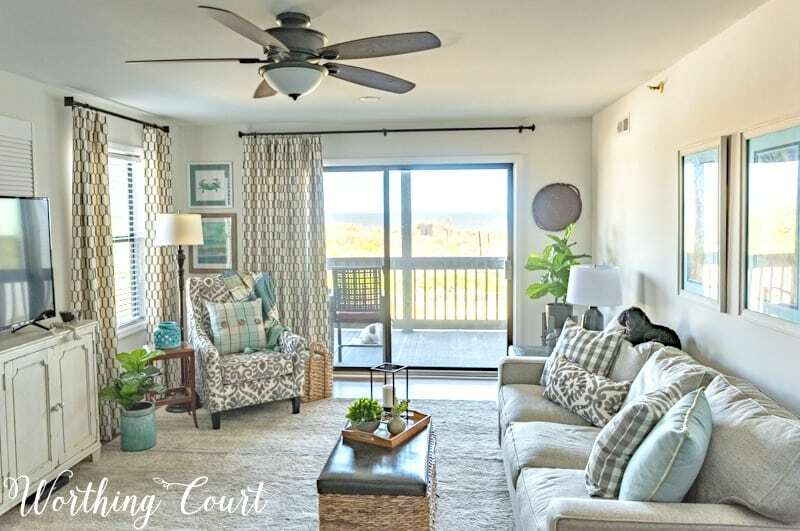 I also think the pops of blue color are great, especially for a coastal home. Did you remove the wall to wall carpet too? So glad you like it! Yes, we removed the carpeting and replaced it with laminate flooring. Wow! 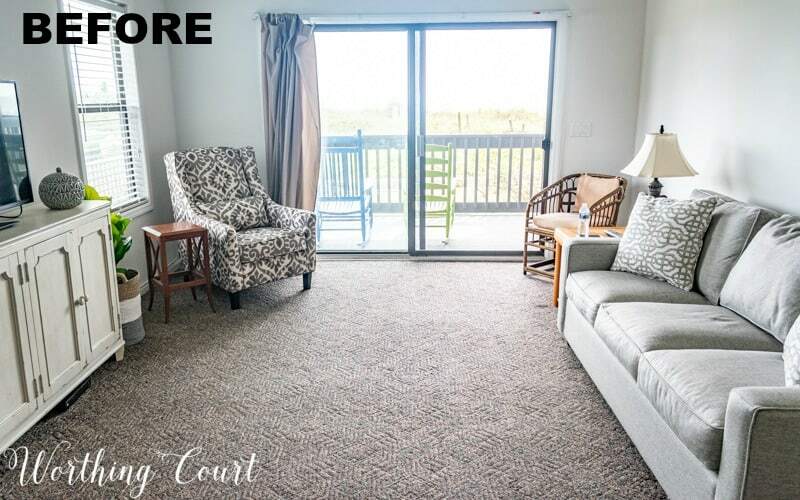 I had to look at the before picture twice to make sure it was the same room! I have a large wall with 4 windows that span 15 feet and I have been putting off doing anything with them. It is so intimidating, but your photos have inspired me. Thank you for sharing! I can’t believe what a difference the curtains make! Love the fabric you picked. Hi Suzy! I just love your room refresh! I also absolutely agree about curtains being the jewelry of a room. 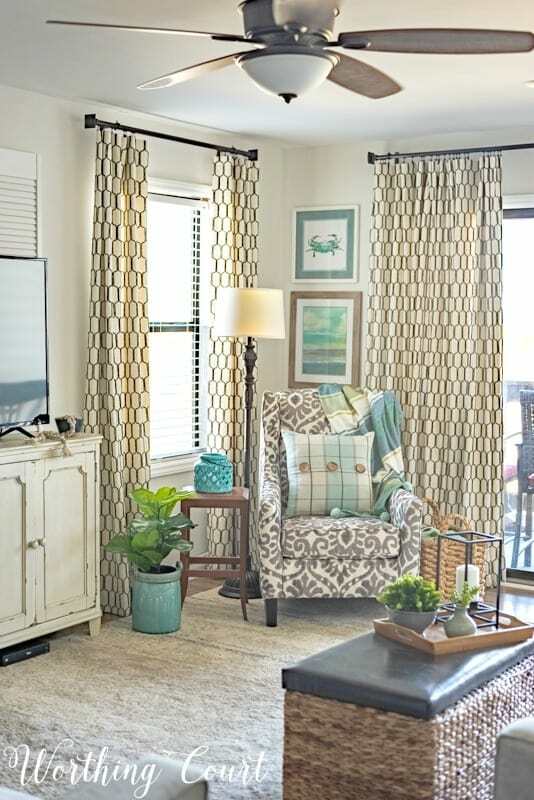 I’m doing a room refresh in my master bedroom and just ordered new curtains! My room is coastal and even though the colors are there, I’ve tired of the pattern. My new curtains are going to be so light and bright! I love how you mixed the patterns also. Thanks for sharing your beautiful ideas! 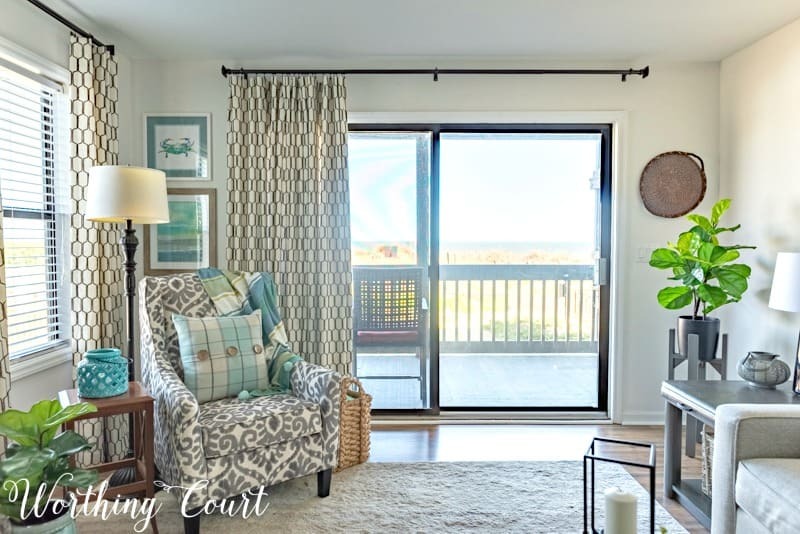 Your new curtains are amazing – and I noticed how the pattern pretty much repeats the woven effect of the coffee table – really good job! But – and isn’t there always a “but?” My eye can’t accept the patterned chair against the pattern of the curtains. I can’t find a connection between the two. You have done wonders re-doing your vacation condo and I hope you’re ready to enjoy it instead of working in it. The time to relax is here!! Thank you for the info on the Interior Alternative. I could check out the Vernon Hills store, even though I don’t really sew. But that doesn’t mean I couldn’t have someone else do the sewing for me! I agree that bare windows make a room look unfinished. Your room came together nicely. Suzy, I wish you could just do a make over on my whole house! Wow,what a difference the drapes make,pulls the entire room together, looks beautiful. LOVE it ! Looks just great ! We have been in this house a year and a half and I still had not put up drapes in our Master.. Even the Husband would occasionally ask when??? I just had not found the one until about a month ago ! I just didn’t want to rush it and end up hating them every time I walked in the room or opened my eyes… I made the mistake in the family room and rushed my purchase and I can’t tell you how much I dislike them! Any hoooo ! I love my drapes in my Master and now even my Husband keeps telling me how different the room looks and how much it has helped his sleep LOLOL Its definitely darker having them in the bedroom early in the morning!